The Westland District Council confirmed today that it will continue to support response and recovery operations for the clearance of rubbish from the Fox and Cook Rivers and South Westland beaches for another two weeks, while it investigates options to fund the massive clean-up that will be required for several more months. At a meeting today the Council considered a report on the future options for managing the ongoing environmental impact of the record-level 26 March floods entering a long disused Fox Glacier landfill. Rubbish was washed downriver, out to sea and washed back along West Coast beaches from a point about 10km south of the Cook river, to 50km northward. Much of the impacted area is within the UNESCO World Heritage area. Mayor Bruce Smith said the report makes it clear that Westland District’s 6500 ratepayers simply cannot afford to continue to fund the clean-up indefinitely. “This is a disaster of national scale,” Smith said. “The area impacted is a major environmental taonga and tourist attraction. It has enormous economic, cultural and natural value for the whole of New Zealand. We will need all of New Zealand’s help to get it back to the pristine condition it once was. A huge recovery programme involving national agencies, local government, contractors and volunteers has already cleaned up tonnes of rubbish, but Smith said the job is far from completed. “We are extremely grateful for the help we have received from government and local government agencies and personnel, local business and dozens of volunteers. Smith said Westland District Council has sought central government advice on where it might access alternative funding for the ongoing clean-up. After three weeks of intense clean up efforts collecting rubbish spread along some South Westland coastline following a severe flood event which affected the disused Fox Landfill, the operations are winding down for the Easter break. Numerous volunteers, government agencies and local businesses have supported the response which have been based out of Franz Josef. New operational plans will be implemented in the coming week and options for earthmoving machinery, contractor involvement, waste sorting and disposal will be in place when the operation resumes. Intelligence for the response and future strategic planning has been gathered through a number of sources and information received from spatial visualisations along with feedback from field operations have produced a robust GIS picture of areas that have been cleaned and identified waypoints for fadge collection. 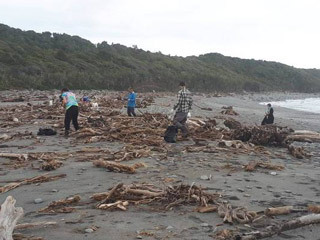 Local Recovery Manager, Te Aroha Cook said “It is recommended the public don’t attempt to collect any rubbish from the beaches or the river bed over this period. There are numerous hazards amongst the rubbish and the health and safety of all trained staff and volunteers has been the top priority since clean-up began. Clean up work of rubbish that spread onto some coastline and river from the disused Fox landfill has continued this week with 45 fadges, two fridges and an oven being removed from impacted coastlines to staging areas. Over 140 helicopter flights utilising operators from the Fox and Franz area, have transported 255 people to remote beaches, provided reconnaissance opportunities for response staff to gather intelligence and remove collected rubbish. Approximately 150 volunteers have been involved in the clean-up to date, with many other offers of assistance coming through to the operations centre. Mike Bilodeau, volunteer coordinator said “this week, our teams have really been targeting Waiho Beach, the area near Waitapi Creek, and both sides of the Fox/Cook River mouth. It’s incredible how happy everyone comes back after working away at such a heart breaking task. It must be a mix of being outside in a beautiful area, and doing something good for the environment. Our volunteers bring us back important information and intelligence at the end of each day. They also come back with lot of ideas about the rubbish problem, both locally and worldwide. It’s great to hear what they have to say and see how passionate they all are”. Many other agencies are working closely together to lead the clean-up operation ensuring it is run safely, implementing operational plans, and analysing long-term options. Department of Conservation staff have been focussed in the upper reaches of the Fox River area. The department has provided staff from around the South Island and they, along with local teams, are collecting large amounts of rubbish as they work their way down the river flats. Operational team members and volunteers will have a well-earned break over the Easter weekend with action plans being reviewed for the following week. “Encouraging time off to all those who have been actively involved in this response and recovery, will provide everyone an opportunity to rest and spend quality time with their families” said Te Aroha Cook, Local Recovery Manager. “Many people and businesses have been committed to the clean up over a number of weeks and the upcoming holidays will be a welcomed time for many. The Westland District Council are immensely grateful to our partner agencies, volunteers and all others who are contributing to this operation,” she said. The Fox River landfill clean-up is expected to make good progress this week, following the opening of the Waiho Bridge, which means volunteers can use vehicles to access remote locations, rather than relying on helicopter transport. The Westland District Council will continue to use helicopters to transport teams to areas inaccessible by 4WD vehicles until Wednesday and for ongoing aerial surveys throughout the response. During the weekend, a team of volunteers completed a survey of the Fox River and Cook River. This survey extended 20 kilometres, from the old Fox landfill to the Tasman Sea. The survey mapped areas of importance for rubbish recovery in the coming weeks. It provides accurate coordinates to teams to locate waste more readily. The survey also helped the Council confirm completed areas and where to collect bulk bags of waste from the clean-up, as well as providing a visual assessment for third parties to review. This week, volunteers and the Department of Conservation (DOC) crews will access sites using 4WD vehicles. The Council is trying to source appropriate vehicles from other supporting agencies and businesses. “We have made significant progress in the clean-up in the past week. The aerial footage will assist significantly in efforts this week as we can pinpoint locations and determine the best route for access,” says Local Recovery Manager, Te Aroha Cook. “During the weekend, our volunteer teams worked on cleaning-up Sandfly Beach, Saltwater Bay to 700m up the lagoon, Fox Cook River Mouth – South, Waitapi Creek, and Fox Cook River Mouth – North. Volunteers are collecting rubbish that spread onto beaches and rivers when severe flooding breached an old Fox River landfill nearly three weeks ago. Further updates are available on the South Westland Coastal Clean-up Facebook page https://www.facebook.com/southwestlandcoastalcleanup/ and Westland District Council’s website https://www.westlanddc.govt.nz/. The combined efforts and goodwill of volunteers and government departments continue to make good progress in the clean-up of the rubbish washed up from a disused landfill nearly 2 weeks ago following flooding of the Fox River in South Westland. A Department of Conservation representative said over 25 DoC staff from throughout the South Island are in the area, with specialist teams preparing to stay overnight in huts over the coming days to minimise fly in time and along with Landcorp, have made 4x4 vehicles available for use to trained response staff. Maritime New Zealand have 5 National Response team members in Franz Josef assisting the process. These people would normally be leading teams dealing with maritime incidents and marine oil spills. Their specialist skills are assisting the smooth running of the response. Mike Bilodeau, an Okarito local, started reaching out for volunteers when rubbish started showing up on the beach, and has been inundated with offers of help ever since. “We have had people contact us from all over the country, people who saw what was happening along our beautiful coastline and just wanted to lend a hand”. Volunteers will continue their work over the next week and we are grateful for the support. If you wish to volunteer, please email foxlandfillresponse@westlanddc.govt.nz providing each person’s full name and email address along with your current location or either north or south of the Waiho River advising availability by 3.00pm the previous day. 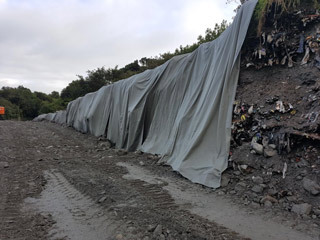 Work is being undertaken to protect the closed landfill, lining the eroded area with geo cloth and filling in the bank area with rock from the river. A coordinated response to the cleanup is underway with a contractor employed to remove rubbish from the environment, in conjunction with the Department of Conservation who are assisting with the provision of staff and equipment. Centralised dumping places have been established at Okarito, Fox Glacier and Franz Josef for volunteers to dump rubbish collected from along the coastline beaches and river area. Volunteers are asked to continue to check the South Westland Coastal Cleanup Facebook page for updates and information. The Fox River and surrounds have been identified as the worst effected, with heavy items lodged in-river and through the bush and land surrounding it. The clean-up of the mid and upper stretches of the river has been identified as too hazardous for volunteers to help with. Teams of people familiar with the difficult conditions on the river and able to use specialised equipment will clear the rubbish in these areas. Ground access to areas of coastline is being organised with landholder. Access ways will be made safe for people to use in order to reach the beaches.